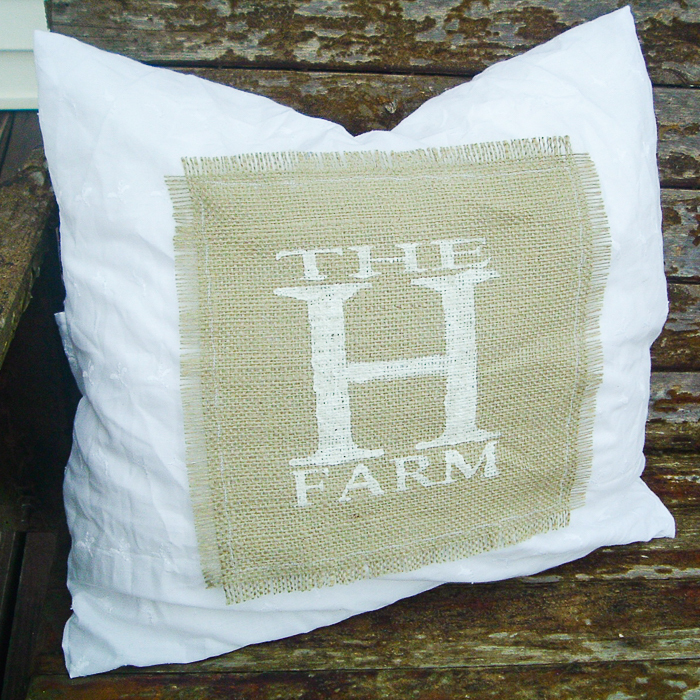 Did you know that it is easy to make your own DIY pillow covers? 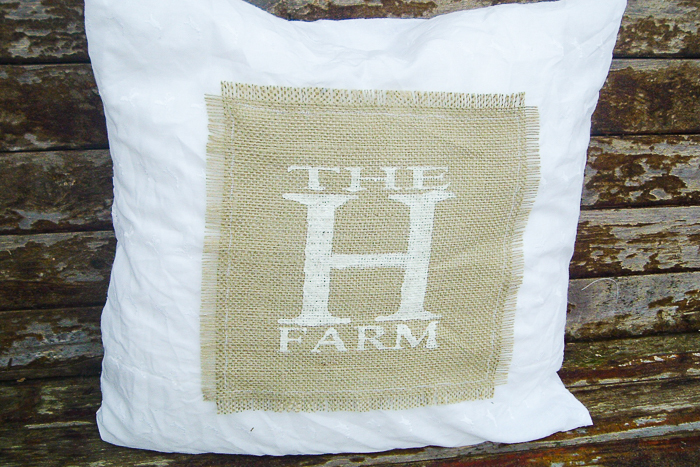 Let’s combine some burlap and lace for a rustic yet elegant farmhouse pillow cover! You can customize with the same design as I have below or you can create your own. Let your imagination run wild with this DIY pillow project. This was originally posted on April 14, 2011 but I am republishing with some new content. Some links below may be affiliate links which means that you do not pay anymore, however, a portion of your purchase will go to support this site. The graphics on the front could, of course, be anything you wish. For me, I decided to show off the fact that we live on a farm! First of all, let’s work on the burlap portion. 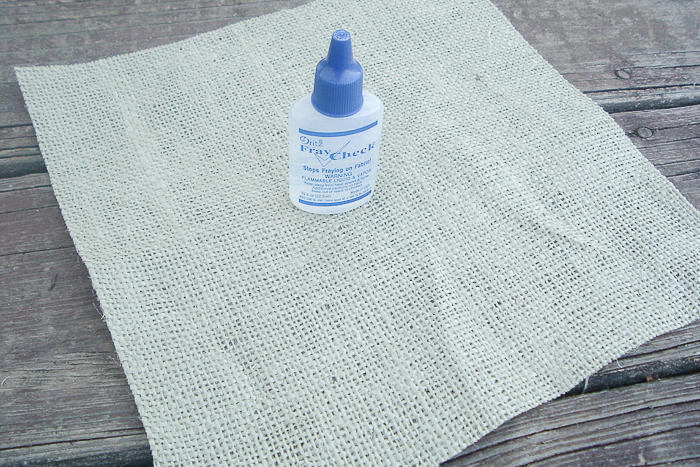 My pillow cover measures about 17 x 17 and I started with a 10 x 10 inch square of burlap and some fray check. You can get fray check at Wal-mart or any hobby store. It is not expensive and it sure does the job! 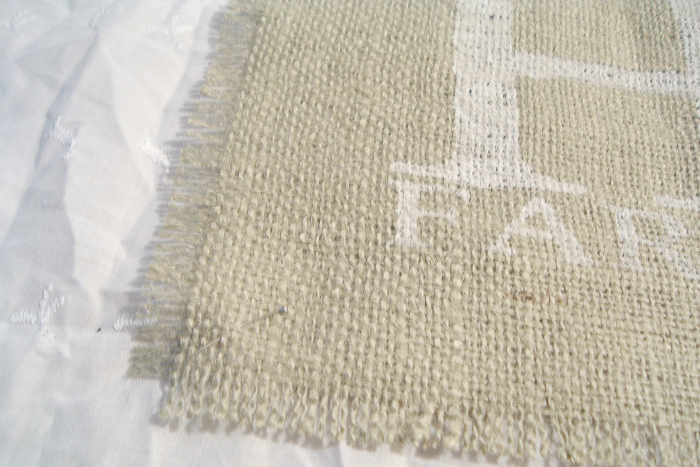 The first thing I did was to pull out pieces of burlap all around the edges to get a frayed edge. I pulled 5 strings around each side — the amount is up to you and how much fray you want. Then just use your fray check liberally all around that outside edge. After it dries it does not affect the color. 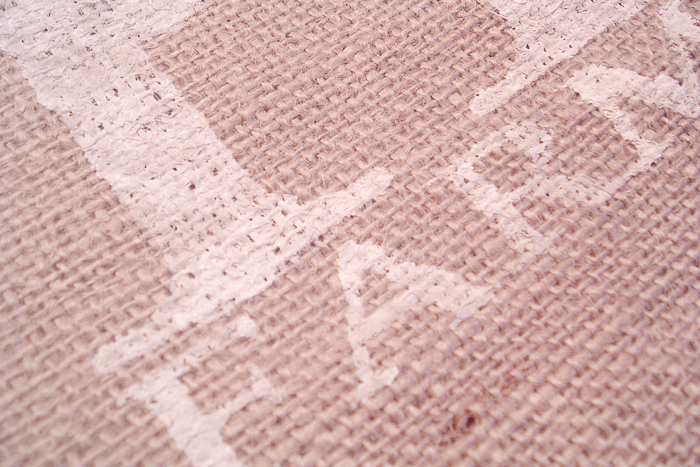 However, you can use the fray check on the back of your square if you are worried about it. 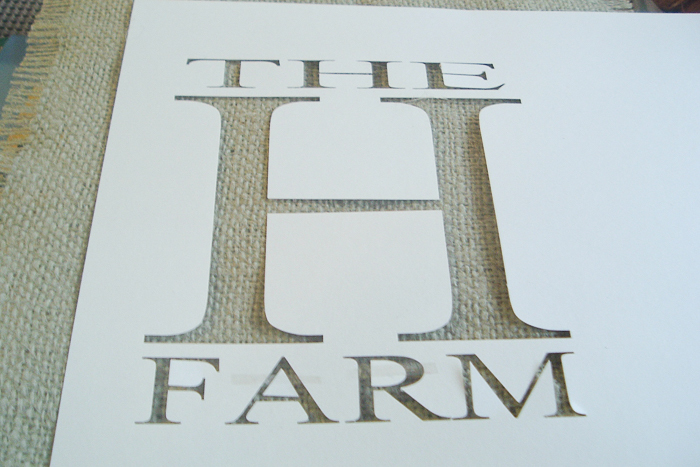 You can then make your own stencil using a Cricut machine. Click here to get the cut file for this one and change the initial if you would like. I cut mine from cardstock and used little pieces of tape to hold in the middles of my letters. 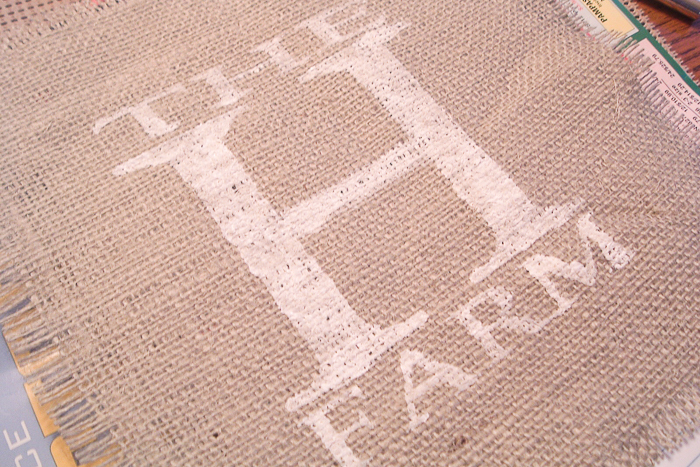 Stenciling on burlap is not an exact science — all those bumps leave some room for your paint to run. Carefully go over with very little paint to get as little running as possible. You can always do multiple coats if needed. The area where I used tape to hold in the letter middles, I touch up by hand with a small brush. Now while that is drying, let’s talk about the “lace” portion! I absolutely love this fabric and have used it in several places in my bedroom. I just cut one looong strip. Enough to cover the front and back of my pillow plus some overlap for an envelope closure. Make it the width of your pillow plus a seam allowance. I then marked with pins where the “front” of the pillow will be — top and bottom. 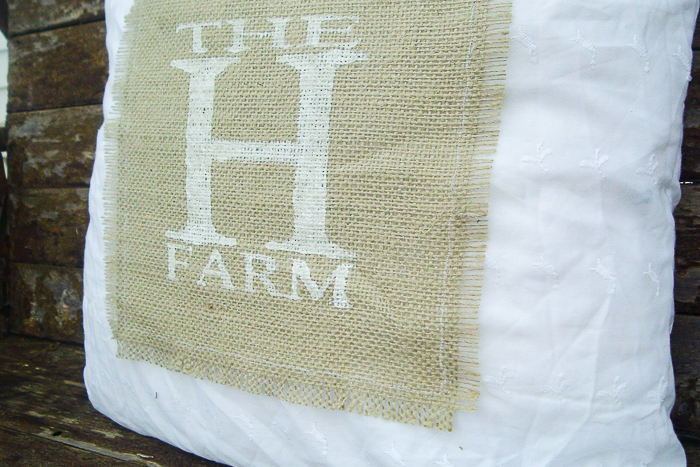 Then once your burlap piece has dried, center it on the front area of what will be your pillow and pin in place. 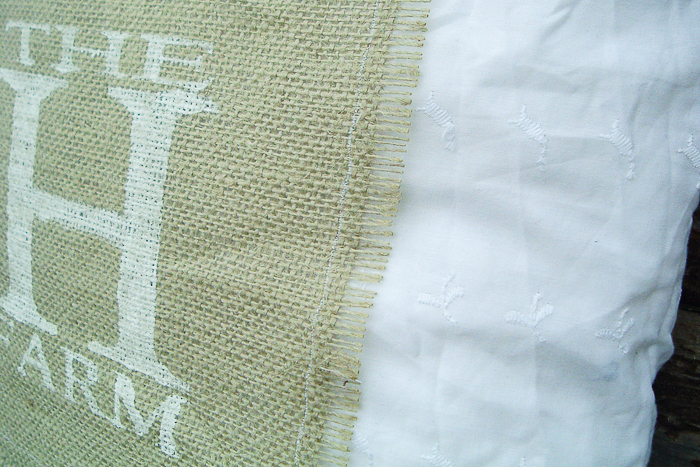 I used a fancy stitch on my machine to go all the way around the burlap piece. A straight stitch will work fine. 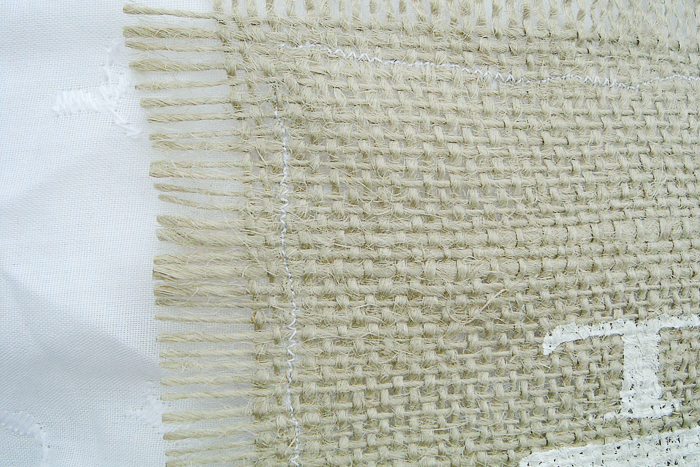 Sew around all 4 sides of the burlap. Now to make your DIY pillow covers, you just have to hem both of the short ends. 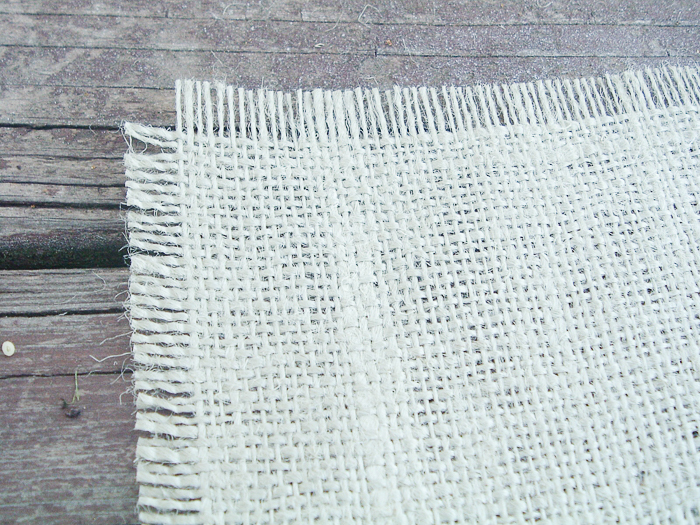 Then fold your long piece on the pins where the right sides are in (so burlap to the inside!). Sew up both sides of the pillow cover. And flip right side out through your envelope closure. Stuff in your pillow form. Then enjoy the great pillow cover with an awesome contrast in texture! I love different textures combined into one! Gorgeous lace accents right next to the rustic texture of the burlap. You can change the front graphics to anything your heart desires. Perhaps a silhouette? Just a plain monogram? Go ahead and stalk your fabric store for some lacy goodness so you can make your own! 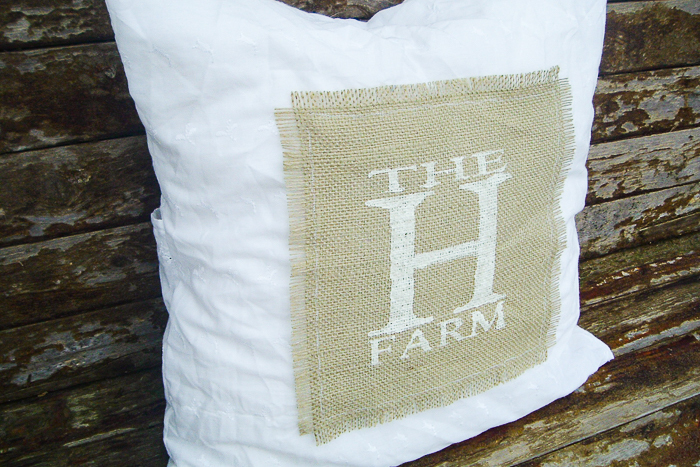 Now you can make your own DIY pillow covers for any room of your home. 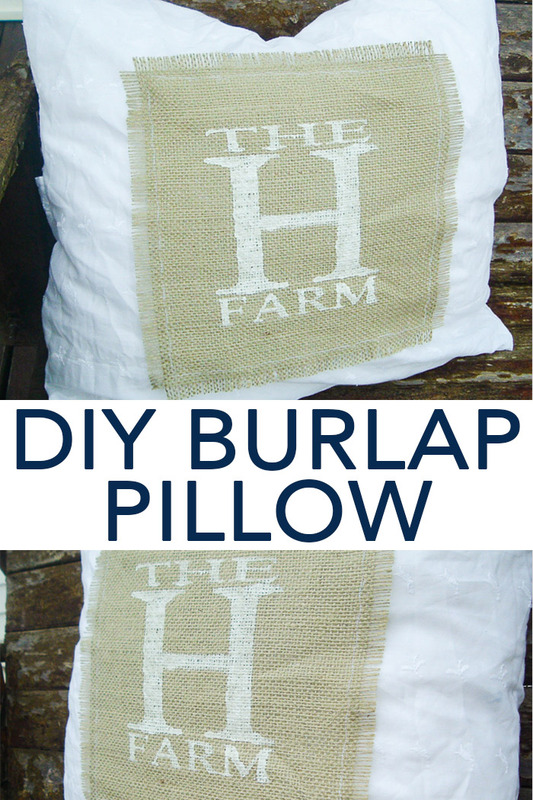 Love this tutorial and want more pillow ideas? Try the links below! Sign up for our email list and we will deliver weekly inspiration with tips and tricks for your machine right to your inbox! Angie, this is so pretty! Thanks for the tutorial too, as it looks so simple now. I am wondering about that silhouette. Is it a Cricut product? What a wonderful thing to have for any graphic design work. This looks lovely, hope to see you at My Dream Canvas. Angie! I love your new pillow! Thanks for linking up and linking back! 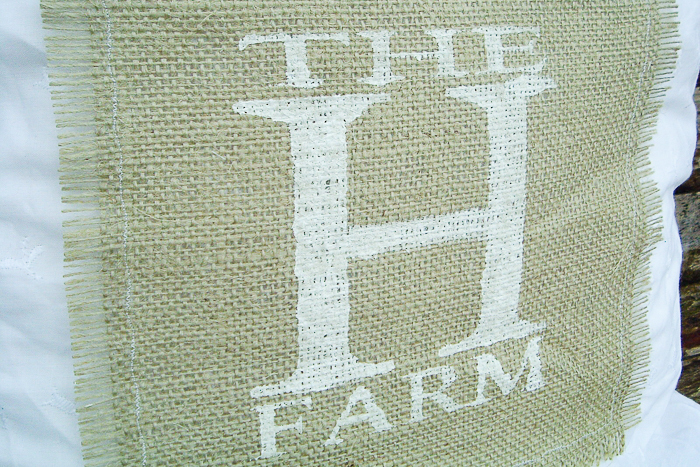 Burlap really is UH-MAZ-ING, my husband works at a coffee roastery so I got the hook-up! Love your pillow, such a great idea!! Hi, friend! I’m admiring all the creativity in your blog so can you please share them at the Creative Bloggers’ Party & Hop? 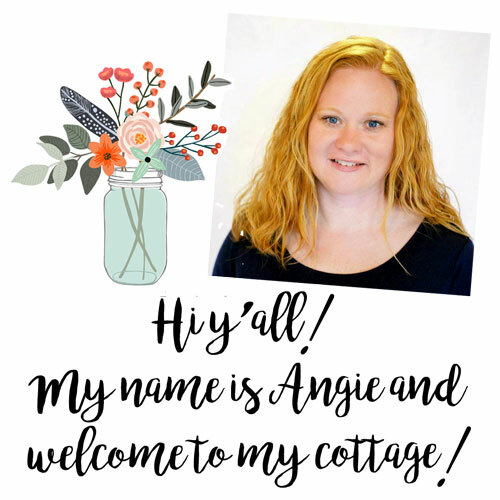 You can find us here: http://www.homemakeronadime.com/2011/05/creative-bloggers-party-hop-050111.html. I love this pillow! I had actually seen a picture of it online a while ago but am glad to finally see the walk through and meet the creator! Very very nice – earthy, so so (shabby) chic, rustic yet VERY professional looking! What type of paint? Typical dabbing/stenciling action for “brushing? it on? Love love love it!!! I love that you republished it! We are always looking for inspiration, and this helped a ton. Pinned!